Originally published in 1922 by B. W. Huebsch, Inc. As a lover of history, what is particularly fascinating about this book "The Myth of a Guilty Nation" is not whether this is the best explanation for WWI. It is worth seeing how small groups of state oﬃcials engaged in secret actions that led to a catastrophic war, and continually lied throughout the whole process to provide themselves ideological cover. Albert Jay Nock wrote one of the ﬁrst American books of WWI Revisionism, revising the received story of why WWI began. Originally published in 1922 by B. W. Huebsch, Inc. The Myth of a Guilty Nation was Albert Jay Nock’s first great antiwar book, a cause he backed his entire life. The book came out in 1922 and has been in very low circulation ever since. In fact until recently it has been very difficult to obtain in any form. The narrative has incredible staying power. The burden of the book is to prove American war propaganda to be false. 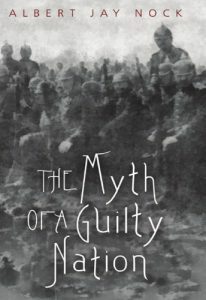 As a lover of history, what is particularly fascinating about this book “The Myth of a Guilty Nation” is not whether this is the best explanation for WWI. It is worth seeing how small groups of state oﬃcials engaged in secret actions that led to a catastrophic war, and continually lied throughout the whole process to provide themselves ideological cover. What is fascinating is the great contrast Nock makes between two wholly diﬀerent views of the origin of the war. While history and reality seem settled and known, people at diﬀerent times have radically diﬀerent understandings of the exact same events. What Nock brings to the fore is the extent to which WWI may be viewed as the opposite of a conspiracy by Germany. If there was a conspiracy it would have been by the allied Entente powers. To a large degree it was blundered into by state oﬃcials, whose desire for peace was fatally undermined by their imperialist ambitions. We should ﬁrst note that he also touches on how many powerful parties simply wanted peace. However, small powerful parties in France, Britain, and Russia all pushed for war and created secret treaties amongst each other. As Nock shows, English, French and Russian foreign policy was directed against Germany and Austria-Hungary, and military spending was quite large, and much greater than Germany and Austria-Hungary’s. All three had powerful cliques who were aggressive towards the Central Powers. They were bound by secret treaties, though this alliance was not publicly acknowledged. In Nock’s book, this is roughly what happened to start WWI: Serbia and the Balkans had a foreign policy dominated by Russia. The assassins of Archduke Ferdinand were linked to the Russian pro-war clique. Russia had been “test” mobilizing since the spring of 1914, and its army alone was equal to Germany and Austria Hungary combined. Russia had a secret treaty with France calling for France to support Russia if Russia mobilized and went to war. The UK had a secret treaty with France. Nock shows evidence that Belgian “neutrality” was a ﬁg leaf to justify unpopular UK involvement. The assassination of the Archduke Ferdinand, conveniently for the Pro-War Entente cliques, set oﬀ the train of powder to the powder keg of a general European war of France, Russia and England against Germany and Austria-Hungary. For sources Nock makes great use of Belgian diplomatic correspondence, which noted little evidence of German aggression. The Soviet-Union also released many embarrassing secret documents from the Tsarist archives. Nock highly recommends Francis Neilson’s and E. D. Morel’s works of WWI revisionism. This book is made up of a series of articles originally published in the Freeman. It was compiled to establish one point and only one, namely: that the German Government was not solely guilty of bringing on the war. I have not been at all concerned with measuring the German Government’s share of guilt, with trying to show that it was either great or small, or that it was either less or more than that of any other Government or association of Governments. All this is beside the point. I do not by any means wish to escape the responsibility of saying that I think the German Government’s share of guilt in the matter is extremely small; so small by comparison with that of the major Powers allied against Germany, as to be inconsiderable. That is my belief, demonstrable as I think by such evidence as has now become available to any candid person. But this has nothing whatever to do with the subject-matter of this volume. If the guilt of the German Government could be proved to be ten times greater than it was represented to be by the publicity-bureaux of the Allied Powers, the conclusion established in the chapters of my book would still remain. Guilty as the German Government may have been; multiply by ten any estimate that any person, interested or disinterested, informed or uninformed, may put upon its guilt; the fact remains that it was far, very far indeed, from being the only guilty party concerned. End quote. As in Maier files , who can be trusted in a world fueled by greed and corruption? Nothing is ever what it seems!